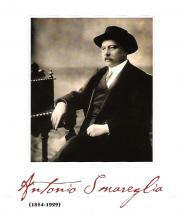 This publication is dedicated to the Istrian composer Antonio Smareglia. It is being published on the occasion of the 150th anniversary of the composer’s birth and of the opening of the memorial room in the composer’s birth-house in Pula. The establishment of the memorial room was sponsored by the government of Italian Region of Veneto, the County of Istria, and the City of Pula. The exhibited material has been donated by the composer’s daughter, the late Silvia Smareglia, her two children, Adua Smareglia Rigotti and the late Silvano Smareglia, and the composer’s great-granddaughters Annamaria Smareglia Borgioli and Mariarosa Rigotti Longo. The exhibition also includes the artwork by the sculptor Alfredo Sficco, the painter Gualtiero Mocenni and other artists who had dedicated some of their work to Smareglia. We would like to express our thanks to the rest of the contributors who had made donations, to the Italian music publisher Casa Musicale Sonzogno di Piero Ostali and to the Teatro Comunale “Giuseppe Verdi” in Trieste.